We create a social photo experience that is fun & easy-to-use for everyone. Create, capture, and share photos and GIFs with our unique photo booth selfie station. 5, 4, 3, 2, 1.......Snap! 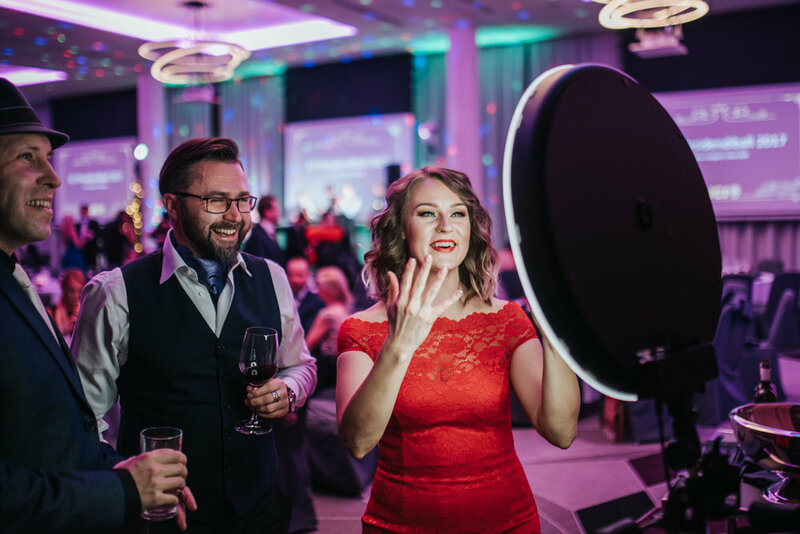 Small or Big events & brand activations are where our photo booth experiences shine. We set up our self-operated HALO in any location with our custom stand. Create branded screens with your custom logo and Gallery for your guest to see their photos instantly. It's super duper important to make everything easy to use. The booth has to look fantastic and the photos must always be amazing. All you have to do is grab a fun prop, smile, tap to start, strike a pose, and start taking photos with the booth. Our Photo Booth is extremely easy to use for all ages! We deliver the photos to each guest's inbox. Guests can see there own photos or popular photos taken by friends as well right from there own device. Beautiful Photo Memories and Instagram friendly Gif ready to start the buzzing about your festivity instantly. Subscribe to be the first to know our specials, receive coupons, and more! Great! You Are Now Signed Up! Big or small, we've got the photo booth solution for you. Book It For Your Special Event!